Take a look at our favorite resources on hands-on science, collected and reviewed by CIRCLE. Experienced Adventist educators sift the ever expanding array of online resources for those of best value for Adventist teachers, administrators and support staff, curating lists for quick and easy use by busy educators anywhere, anytime. Experiments that are inexpensive, effective and easy to do, shared by the NAD Science Curriculum Guide 9-12 Committee members. Free science projects and experiments for all ages. Site includes laboratory resources, book reviews, science links, lab news, questions and answers, glossary, an interactive table of elements, and experiments. More than 25 hands-on science activities are provided in classroom-ready pages for both teachers and students for exploring Earth, the planets, geology, and space sciences. Well thought-out, hands-on activities motivate students and create a fertile environment for learning, LEGO Education (LE) combines the motivational advantages of LEGO Education sets with award-winning software and standards-based activity packs that integrate math, science, and technology into engaging hands-on classroom projects. Interactive website for students dealing with the life and works of Leonardo DaVinci. There are content pages, interactive elements, and hands-on activities. Lesson plans invite students to explore DaVinci’s world and creations and then try some of their own. Very engaging lessons. From beaks to feathers, bird songs to behaviors, God has given us wonderful creatures to learn from. There is a combination of narrative, worksheets and hands-on activities. This unit opens to students the wonders of the third day of creation with a host of hands on activities. The Exploratorium is a museum of science, art, and human perception. The site includes instructions for over 500 simple experiments, hands on activities, a variety of online exhibits, podcasts, etc. The Public Broadcasting Service (PBS) website has many simple science activities for kids. Each activity includes instructions and an explanation of what is happening. The objective of a micro hike is not distance or mileage, but encouraging students to use their observation skills by getting down in the dirt and taking inventory of their environment. Included in the article are several books to take along, as well as many questions to ask students. 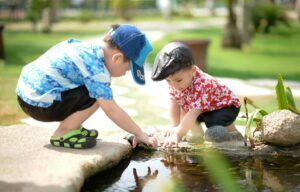 Information and ideas on incorporating learning and gardening, from preschool age through elementary school. Teacher and parent links on subjects ranging from literature connections, grants, gardening in school, wildlife, seasons, weather, and much more. This article describes how to integrate the schoolyard habitat into your classroom, and curriculum. Practical tips on how to create a butterfly garden in a schoolyard habitat, and how to obtain, care for and feed butterflies. A list of online and published resources is included at the end. What would you add to this list? Email circle.adventist@gmail.com to add your resources to CIRCLE.